In his new book, Associate Professor of the Practice of History Robert Savage explores how chronicling 30 years of violence and turmoil in Northern Ireland tested the integrity and independence of the BBC, one of the most trusted and respected media outlets in the world. 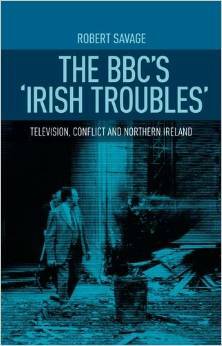 The BBC’s Irish Troubles: Television, Conflict and Northern Ireland (Manchester University Press, 2015) focuses on the challenges the public service provider faced in accurately informing citizens of important events taking place within the United Kingdom. As violence continued, the BBC was attacked, threatened and bullied, by a variety of actors but did its best to stand its ground and maintain editorial independence and journalistic credibility. This entry was posted in Boston College Authors and tagged Ireland, media, television, United Kingdom. Bookmark the permalink.